The St. Louis Weekend Events Guide for Thursday, September 21st through Sunday, September 24th features: Art in the Park, The Greater St. Louis Hispanic Festival, Blues & Brews, Pedal The Cause, Strutt Your Mutt, Renaissance Festival, Oktoberfest, Brad Paisley, Billy Joel, Saint Louis FC vs FC Cincinnati and more. Billy Joel: Currently Billy Joel is still set to go for this weekend at Busch Stadium. Six-time Grammy® Award winner, including the prestigious Grammy® Legend Award. Joel has sold 150 million records over the past quarter century, the singer/songwriter/composer is the sixth best-selling recording artist of all time and the third best-selling solo artist. With legendary hits including “Piano Man,” “Only The Good Die Young,” “Uptown Girl,” “We Didn’t Start The Fire,” “The Longest Time,” and many more, and this being his first solo stadium performance in St. Louis, this is not a concert you want to miss. 360 End of Summer Luau: Say so long summer and say aloha to a night filled with grass skirts, torch lights, city lights and tasty bites! Celebrate summer’s end rooftop style with signature cocktails and more! Plus The event is FREE and open to the public until 10PM, after 10pm a fee of $10 per person. VIP reserved seating is available with a minimum food and beverage purchase, per person of $35. Hawaiian buffet featuring pig roast for $20 plus tax per person. Oktoberfest: The Oktoberfest experience starts with bier. UCBC’s OktoberFestbier/Märzen, Bavarian Lager (Zwickel), and Bavarian Weissbier (Schnickelfritz) will be available in half-liter & liter pours at the fest. Oktoberfest will also feature the standard fare found at Munich’s Oktoberfest celebration, i.e. pretzels, brats, currywurst, roasted chicken, and frikadellen. Popular Oktoberfest competitions like Masskrugstemmen (stein-holding contests) and Fingerhackeln (finger wrestling) will make a return, as will a great line-up of polka & oompah-thumping music from the Bolzen Beer Band, Die Spitzbaum, Dave Hylla’s Good Times Band, The Deutschmeister Brass Band, St. Louis Express, Larry Hallar, Uber Cool, and many more local, popular acts. 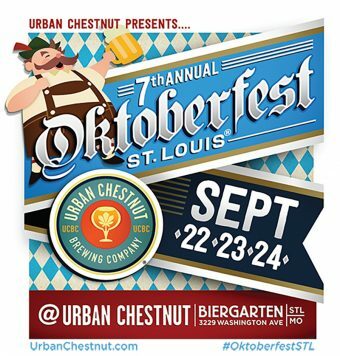 The 7th Annual Oktoberfest St. Louis festival takes place September 22-24 and the Urban Chestnut Biergarten on Washington Avenue. The event highlights the STL Weekend Events Guide from RealLifeSTL this week. The Greater St. Louis Hispanic Festival: The largest Hispanic celebration in the St. Louis area will feature Hispanic Folkloric dancers, over 70 booths and the Los Ninos Kids Corner with piñatas and traditional Hispanic games, live Latino bands playing a variety of music on the premier concert stage including salsa, merengue, latin rock, percussion, cumbia and bachata, traditional folkloric dancers from Mexico, Panama, Bolivia and Colombia, a cultural village with a wide variety of foods and beverages from Latin & South America including Mexico, Dominican Republic, Argentina, Belize, and more, the Low Rider Car Cruise, and other attractions including folk arts & crafts, information booths from several cultural organizations, inflatable rides, petting zoo and a mechanical bull. Strut Your Mutt: Calling all animal lovers, fitness and health lovers, and people who like parks. Join us for this year’s Strut Your Mutt in St. Louis, and be prepared to have loads of fun while raising money for animals. Enjoy festival entertainment including: Bobbing for Biscuits Contest, Best Kisser Contest, Field Day Games, Chill Out Zone, Treat Stations on the Walk Route, and more.Special​ ​appearances​ ​by:Ledy VanKavage, April Powell, Julie Tristan of 103.3 KLOU, Megan Danahey of KMOV, Rich Egenriether, The Count of Tower Grove, Murphy the Yellow Lab, and Bama_roo. there will be fun demos, giveaways from local vendors, food from local food trucks, and more. 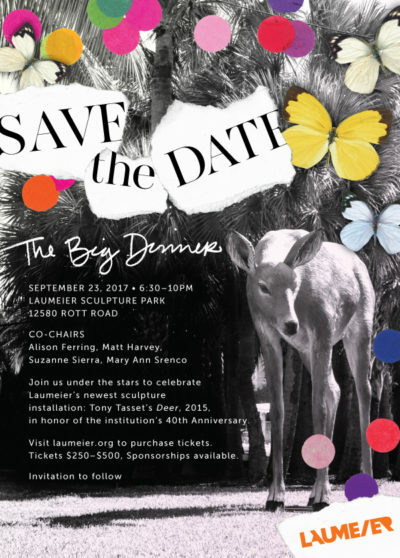 The Big Dinner: Join us under the stars to celebrate Laumeier’s newest sculpture: Tony Tasset’s Deer 2015, to honor the institution’s 40th anniversary. The Big Dinner features a unique outdoor dining experience, drinks, entertainment and more in the Park under the stars. Patron, donor and sponsor guests enjoy an exclusive pre-event VIP Reception with Deer and Eye, 2007, artist Tony Tasset. Proceeds support Laumeier’s mission of engaging the community through art and nature. Blues & Brews: This 4th annual festival will feature live music from four popular Blues bands including: Piano Dan & The Soul City Shakers, Big George Brock, Soulard Blues Band, and Jeremiah Johnson Band. Enjoy brews from St. Louis and surrounding region breweries and food from Brown Jerry Blues and New York Tom’s Food Truck. Tickets are $20 in advance or $25 at the door. Pedal The Cause: An annual cycling challenge to provide critical funding for cancer research at Siteman Cancer Center and Siteman Kids at St. Louis Children’s Hospital. Enjoy Taste The Cause on Saturday and meet local chefs, breakfast from Whole Foods and Kaldi’s on race day, post-ride massages and celebration with live music and entertainment and group photos. Art in the Park: Family, friends and neighbors enjoy art, music and food surrounding the majestic lily pond at the center of the park. There will be artists showcasing a varity of art from textiles to phtography, mixed media, sculpture, glass, painting, ceramics, and more, plus raffles to win art for $1, live music, kids activities, a vintage baseball game, and a classic car show. Brad Paisley’s Weekend Warrior World Tour: Three-time Grammy Award winner, 14-time Academy of Country Music Award winner, 14-time Country Music Association Award winner, and Grand Ole Opry member, Brad Paisley is coming to St. Louis. Brad’s hits include: “He Didn’t Have to Be,” “We Danced,” “Two People Fell In Love,” “Celebrity,” “Whiskey Lullaby,” “Alcohol,” and many more. Special guests include Dustin Lynch, Lindsay Ell, and Chase Bryant. Food Truck Frolic: The final event of the year will feature Despicable Me 3 at twilight. The food truck line up is: Chris’ Smokehouse, Kona Ice, Locoz Tacoz, My Big Fat Greek Truck, Blues Fired Pizza, Sarah’s Cake Stop, Sia’s Italian Ice, Slice of the Hill, St. Louisiana Q, Steak Louie, Thai Jasmine, Waynos, Yo! Salsa, Zia’s, STLBLT, Walk Away Waffles, Shamrock’s and La Chata Mexican Cuisine. St. Charles Oktoberfest: The opening ceremony will kick off the festivities at 5pm on Friday. Saturday is the JDRF One Walk to Cure Diabetes, the Fast Lane Wiener Takes All Competition, Brat Eating Contest, and Raise the Stein Contest. Sunday festivities include the Oktoberfest 5k, 10K and Root Beer 1 mile Fun Run and antique car show. Enjoy live music all weekend long from Squeezebox, Austrian Express, Obenheimer Express, Das Glockenspiel, Randy Clemons Band, The Klaberheads, Matt Wynn, Contagious, That 80s Band, Trixie Delight, and many more. Renaissance Festival: This long standing event that brings you adventure, excitement, and the spirit of the Renaissance returns for it’s 18th season. Travel back in time as you step into the beautifully wooded, 16th century French village we call Petit Lyon! Thrill to the exploits of Jousting Knights on thundering steeds. Roam the village shoppes for unique crafts as our artisans demonstrate period skills like blacksmithing and woodworking. Delight in comedy, music, magic, and more on our nine stages of non-stop entertainment! Feast on delicious food and drink from the far reaches of the globe, and interact with the colorful villagers, nobles, peasants and characters of ages past! This weekend’s theme is High Seas Adventure with a talk like a pirate contest, pirate costume contest, beard competition, tattoo competition, and keg toss. Saint Louis FC hosts FC Cincinnati in the second to last home match of the United Soccer League regular season. STLFC and FCC are both fighting for playoff spots as the regular season winds down. The club is offering a special ticket offer that includes a general admission ticket and a limited-edition Saint Louis FC Oktoberfest mug for just $18. Complimentary Pub 2 Park shuttles are available for fans from various locations throughout the St. Louis area.